In an email (text shown below in full) sent early this morning to coincide with Perris' announcement of the news to his congregation in Germany, Bishop Dietsche announced the appointment of the Rev. John D. Perris to be the new Canon to the Ordinary. I write this morning with the happy announcement of my appointment of the Reverend John D. Perris to be the Canon to the Ordinary in this next season of our life as a church and diocese. 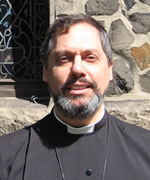 He is currently serving as the Rector of the Episcopal Church of Christ the King in Frankfurt am Main, Germany. John is announcing this same news to his congregation in Germany at this same hour, and in the next weeks he and his wife Catharine and their family will relocate to New York, and he will assume his new responsibilities on June 16. John was born in 1960 and received his Juris Doctor from Yale University in 1986. He then practiced law until graduation from General Theological Seminary in 1998 and his ordination the same year. He served parishes in the dioceses of Newark, Virginia and Massachusetts until assuming his current cure in Frankfurt in 2014. He comes to us as a seasoned parish priest, and an accomplished leader in the church. He enjoys the respect of bishops across our church. But he also brings an astute legal mind to understand and interpret the word and spirit of the church canons, as well as the laws of the state which govern religious institutions, and the pastoral and professional abilities to help under-resourced churches which are more and more facing property development and real estate challenges and opportunities to shape the legal processes which lie before them. He is also a gentle soul and true Christian. He is a genuinely nice guy, and I look forward to working with him. And I am confident that he will become a valued resource for our clergy and churches, and a partner in ministry for me and Bishops Allen and Mary, and for the members of my staff. I look forward to the opportunity to introduce him to the Diocese of New York. When I last needed to call a Canon to the Ordinary, it was clear to me and to the many who commended him that Blake Rider was exactly the right person at the right time for that appointment. Over the next few years he more than demonstrated the gifts and wisdom that the position requires, and he thoroughly earned the gratitude of the many across this diocese, and of me above all. For many, many months, Blake has been in the prayers of the people of this diocese as he continues to struggle with daunting and exhausting health challenges. Especially as we prepare to welcome his successor, I beg your continued intercessions for him, our very dear friend. After Canon Rider's taking of medical disability and his decision not to return as Canon to the Ordinary, I was advised to conduct a focused, directed process rather than a broad-based search. This is what I have done, and I believe that in inviting John to New York I am extending a true and godly call, and trust that we will be well blessed in this new ministerial relationship. I am grateful too, to the other priests who expressed interest in this position. I am thankful for their self-offering. I do ask your prayers in the coming weeks for John and his family as they make this transition.